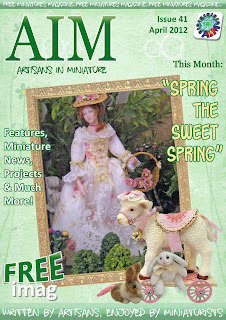 Here at AIM, we are pleased to announce that our spring Edition of the AIM imag is now viewable online! With AIM members bursting with the joys of spring and the promise of warmer weather, they have worked tirelessly to bring us a delightful Spring inspired 41st edition of the Imag. Packed with a wide variety of miniature fun, articles, news and projects for everyone to enjoy, this edition is as ever fully downloadable for FREE! So why not grab yourself a cuppa, curl up in your favourite armchair and enjoy the 41st issue of the AIM Imag! !